I know what will happen next. I’ve already leaned too far forward on my right foot, anticipating the left will follow. 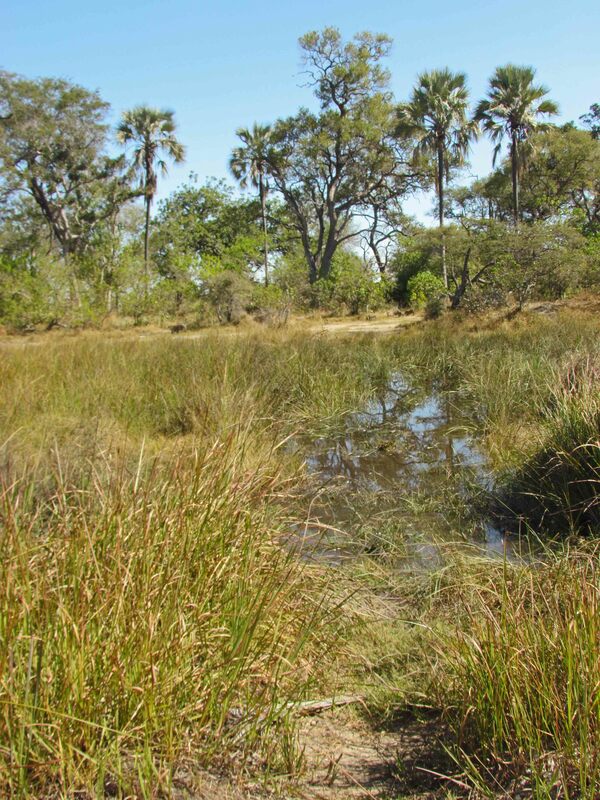 But the clog on that foot is mired in the Okavango muck, cemented in place, my balance irreversibly committed in the wrong direction. What happens next is a slow-motion twist to my right, as I go down in thigh-high brown water and ooze, down into decayed leaf litter, down into a mat of decomposed anaerobic slime. My right arm drops to cushion my fall and my left arm shoots up, holding my brand-new camera above my head – the camera purchased just for this trip to Africa. 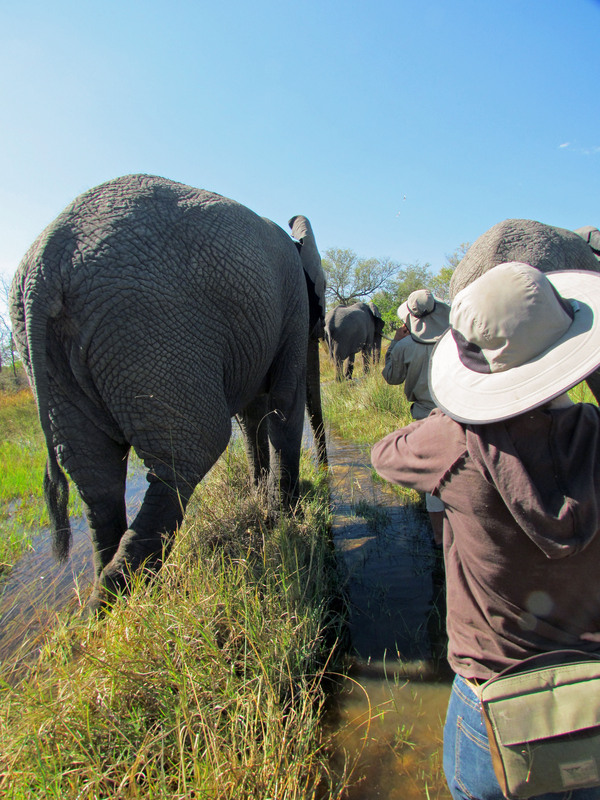 I create primary and secondary waves as my hip and shoulder enter a backwater swamp of the Okavango. The waves push against a small clump of reeds. Elephant dung floats by. A brackish, decayed scent rises. The sun hasn’t moved more than a tick in the blue Botswana sky. I come to rest against the reeds – all of my right side invisibly encased in muck. But my left arm is dry, above the water, my camera clutched at the end of it like a trophy. Sandi is already splashing in my direction. She tugs on my dry arm. “Let me help you up,” she offers. She places its strap around her neck. I roll against the reeds and use both hands to push myself upright. I reach down, and blindly find my shoe. I need both hands to pry it out of the muck. “I think I’m going to have to go barefoot,” and flinch at a secondary thought. “I hope there aren’t any lead wood thorns.” Two-inches long, strong as steel, straight as nails – they’d go right through the bottom of my feet. “I’ll go first,” Sandi says. Her sandals aren’t sticking in the ooze. Oddly enough, the muck at the bottom of the swamp is soft as a pillow to my bare feet. It wraps around my ankles and squishes up between my toes. I place each foot carefully, not committing my weight until it’s safe to do so. It takes forever to cross. Doug and the elephants patiently wait for us on the opposite side. When we reach the far bank I put my clogs back on. Sandi hands me my camera. I look down at my pants and shirt, both mottled by muck. Great writing! I wish I could write as effortlessly as you do.I often fly to many of these camps to carry out work there.You have managed to captured the whole atmosphere perfectly. Thanks, Roger. The writing goes through a lot of drafts before it appears “effortless.”. Hope you continue to follow the blog. Mi’m just finishing a book about elephants and part of that is on this blog, too. I’m curious, who do you work for? Soon, Louis, soon. Water was too new to have critters in it, yet. Lucky I guess!